Less than a year after announcing that all its 2017 vehicles support Apple CarPlay and Android Auto, Ford is bringing the same features to its previous year's models as well. 2016-year Ford vehicles equipped with the automaker's SYNC 3 technology can now download an update fitting them out with both Apple CarPlay and Android Auto. 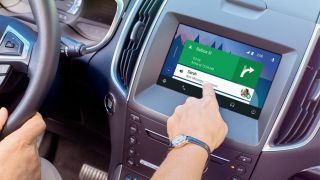 Interested drivers can get the version 2.2 SYNC 3 update via downloading to a USB drive, taking their car to a local dealer, or — for the first time — downloading it using an internet connection. To get the update over-the-air, a Ford SYNC 3-equipped vehicle must have Wi-Fi compatibility and automatic system updates enabled. Ford says the update will work for as long as Wi-Fi is connected prior to the vehicle turning off, adding that you don't actually have to keep the car running to install the new features. One the update is installed, you'll need an iPhone 5 or later running iOS 7.1 or higher to make use of Apple CarPlay, or an Android 5.0 or higher device to run Android Auto, so be sure your device is also up-to-date while your car upgrades.